Can I Make Quiche Ahead of Time? Can You Freeze Eggplant Parmesan After Baking It? 1 Can I Make Quiche Ahead of Time? 2 Can You Freeze Eggplant Parmesan After Baking It? Moussaka is known to Americans primarily as a Greek dish, but variations of this rich casserole can be found throughout the Middle East. It's built in layers, like a lasagna, though in this case the meat and sauce are layered with eggplant and sometimes potatoes, rather than sheets of pasta. One thing all the variations have in common is that they freeze well for later use. Like other layered casseroles, moussaka is assembled in the dish. The first layer in the casserole can be either potatoes, thinly sliced and fried, or cooked slices of eggplant. Cover this bottom layer with a layer of well-spiced ground lamb or beef, then add a layer of cooked eggplant slices. Cover those with the remaining meat, and smooth a layer of thick bechamel, or white sauce, over the top. The meat mixture can be made with or without tomato sauce, and the white sauce can be made with or without shredded strong cheese in it. 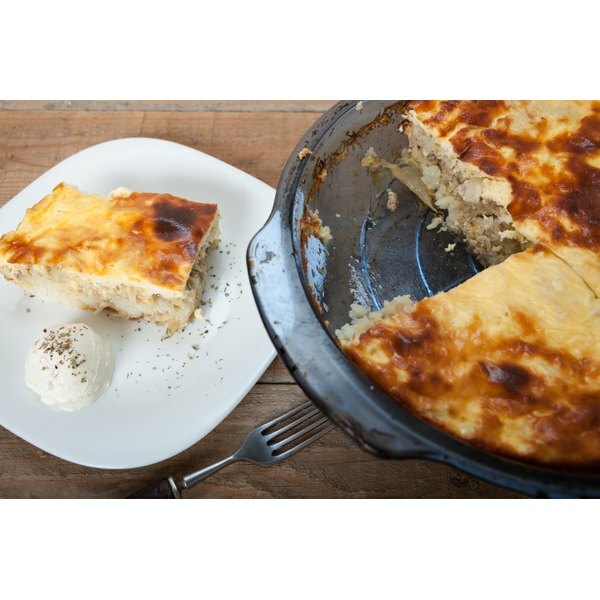 Assemble the moussaka in a ceramic or tempered glass casserole dish that is both freezer and oven safe. As soon as the dish is completed, press a layer of parchment paper or plastic film wrap directly onto the surface to protect it from freezer burn. Stretch a layer of plastic film wrap over the entire dish to seal it, then cover the dish with a layer of aluminum foil for added protection. Freeze the dish immediately. It can be thawed before reheating, or baked from frozen. Thawed moussaka bakes in approximately one hour, while frozen requires 1 1/2 hours. Sometimes it's more convenient to freeze moussaka after it's baked, so it's only necessary to reheat the dish to a foodsafe temperature of 165 F. Prepare the moussaka as you normally would, and bake it for one hour until done. Cool the dish immediately to room temperature by putting it in a well-ventilated area, then refrigerate it until cold. Seal the casserole dish with plastic film wrap and then aluminum foil, and freeze it. Alternatively, make two or more smaller casseroles in loaf pans or disposable foil pans. These will reheat quickly in the oven for smaller meals. Sometimes it's convenient to freeze moussaka in portions sized for one, two or four people. Individual portions can be frozen by cutting them from the cooled casserole and wrapping them carefully in plastic wrap, or sealing them in small freezer bags. However, portions retain their shape better if they're frozen in rigid containers. Cut portions to size from the original casserole and seal them into their containers, pressing out as much air as possible. For maximum versatility, use a mixture of microwaveable and oven-ready containers. Fred Decker is a trained chef and prolific freelance writer. In previous careers, he sold insurance and mutual funds, and was a longtime retailer. He was educated at Memorial University of Newfoundland and the Northern Alberta Institute of Technology. His articles have appeared on numerous home and garden sites including GoneOutdoors, TheNest and eHow. Can You Freeze Cornish Pasty? Can I Prepare Baked Brie Ahead of Time? Can I Make Baked Macaroni & Cheese With No Flour or Butter? Can I Freeze a Raw Potato Dish and Bake it a Week Later?